Monte Amiata is a volcanic cone that rises 600 m about the surrounding plateau to reach a total height of 1732 m, making it the second highest volcano in Italy. Mt Etna, the highest, rises to 3315 m. Monte Amiata is the northernmost of a string of volcanoes along the west cost of Italy and divides the Valdorcia from the Maremma, and dominates the landscape of southern Tuscany, Italy. Monte Amiata last erupted about 180,000 years ago and continues to fuel many thermal springs (terme) around its base, including the hot water bathing centres of Bagno Vignoni, San Casciano dei Bagni and Bagno S. Filippo. There is bathing year round at the swimming pools "Val di Sole" and "Terme S. Filippo", which make use of thermal water directly from the springs. If you prefer to swim in a more natural environment, there is the "gora" below Bagno Vignoni, or the "Fosso Bianco" in Bagno S. Filippo. Even the more distant hot springs at Saturnia and Petriolo in the Alta Maremma derive their heat ultimately from the volcanic roots of Monte Amiata. Beech and chestnut trees cover the lower slopes of Monte Amiata, and the higher slopes are covered with old growth forests that are spectacularly coloured in the autumn and make the mountain extremely popular among hikers. Both the flora and fauna of these forests are unusually diverse, with a number of endemic species. Even wolves were present until the end of the second world war. There is a now an excellent Parco Faunistico with marked paths that guide the visitor through the various habitats of the mountain. The "gateway" to the Monte Amiata Nature park is Arcidosso. Click here for places to stay in Chianti - villas, village apartments, Bed and Breakfast, agriturismi with pool. 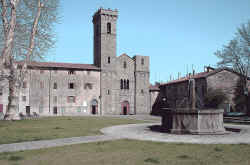 The Abbadia of San Salvatore on the eastern slopes of Monte Amiata is one of the oldest monasteries in Tuscany and had control over a vast area. In the mediaeval period, it was an important station on the Via Francigena, the pilgrim route from northern Europe to Rome. The town of Abbadia San Salvatore developed round the monastery and has one of the best preserved mediaeval centres of any town in Italy. It also has a modern quarter that developed as the town became a popular summer and winter resort. The mediaeval borgo preserves its outer walls and streets intact, with mediaeval and Renaissance houses of local grey stone. The abbey, which was immensely rich and powerful, enjoyed numerous privileges under the protection of popes and emperors, and exercised feudal jurisdiction over much of southern Tuscany. It was founded, according to tradition, in 743 by the Lombard king, Ratchis, on the spot where he experienced a vision. At the peak of its temporal and spiritual powers in 1035, the abbey was rebuilt and reconsecrated by Abbot Winizzo. This was followed by a period of decline when the abbey came under the dominion of Sienna in 1347, and eventually was incorporated into the Medici state in 1559. The monastery was suppressed by Grand Duke Leopoldo II in 1783 and most of its treasury and archives were removed to Florence. A Benedictine community was reinstalled here in 1939. The town of Abbadia San Salvatore is well-known for the festival of Fiaccole della Notte di Natale takes place every Christmas Eve. The festival is said to have been preserved for a thousand years, from the days when those living in the tiny villages surrounding the Abbey itself lit large fires to warm themselves during their vigils on the Eve of the Birth of Christ, and is said to commemorate the shepherds who followed the Star on the night of Christ's Birth. Thirty stacks of firewood, each 5 m high and harvested from the forests of Monte Amiata, provide the fuel for bonfires. A torch-lit parade winds through the town bringing torches to light the stacks, the participants singing Christmas songs. 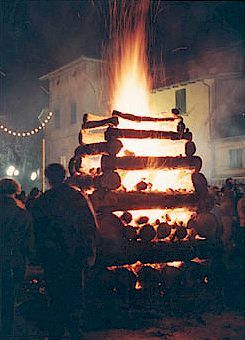 The bonfires burn until dawn and the local enoteche open their doors, offering wine and local gastronomic specialties to the celebrants. Tuscan villas in the countryside of Chianti and Tuscany. Basilicas, Monasteries, Hermitages, Abbeys and Pievi of Tuscany. Monte Amiata © ammonet InfoTech 2006 - 2018. All rights reserved.